Fire Door Safety Week is a national campaign to raise awareness of the lifesaving role of fire doors and the importance of installing and maintaining them to a high standard. Poorly fitted and damaged fire doors can affect their integrity; effectively stopping them from performing correctly. Door closers play a vital role in fire door safety, enabling the door to close fully whilst not in use or when the fire alarm sounds. When shut, the fire door compartmentalises the room and acts as a barrier against the spread of fire. Without a door closer fitted, the door remains open and no longer protects the room and the surrounding area. Briton provides a wide range of door closers including overhead, guide rail and free-swing options to suit various applications, all of which are third party accredited by leading certification scheme Certifire. The independent certification body provides assurance that Briton door closers perform to a high standard and are compliant with the necessary regulations when correctly installed. To promote Fire Door Safety Week, Safelincs have partnered with Briton to provide our customers with exclusive discounts on their overhead door closers, extending the offer period for one month until the 20th October 2015. So don’t miss out on our limited time special offers! Safelincs are proud to support a trusted and reliable brand and are pleased to hear Briton will be donating to the Children’s Burns Trust charity at the end of Fire Door Safety Week. Not sure which Briton door closer is right for you? Check out the Briton door closer selector, or call our customer service helpline on 0800 612 6537. Fire Door Safety Week: Have You Checked Your Fire Doors Recently? Fire doors are absolutely crucial when it comes to delaying the spread of fire throughout a building. Effective compartmentalisation can be the difference between losing a single room, and losing an entire property to fire. Fire Door Safety Week 2015 runs from the 14th until the 20th of September and is intended to help raise awareness of the importance of fire doors whilst encouraging building owners to check the condition of any fire doors they have installed. Well maintained fire doors provide usually a minimum 30 minute barrier to prevent fire passing through, but to do so, the door must be closed. It is illegal to wedge open fire doors or hold them open with, for example, a fire extinguisher, and business owners leave themselves open to hefty fines and even jail sentences if they fail to prevent this from happening. 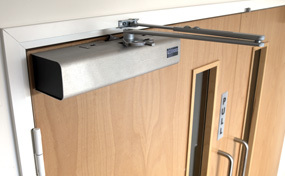 A simple way of addressing this problem is the Dorgard Fire Door Retainer and the Freedor Wireless Free Swing Door Closer, which are legal ways of holding fire doors open. These devices allow doors to be retained in an open position, but automatically release the door in the event of a fire alarm, meaning the fire barrier is re-instated when a fire is detected. Commonly found in public buildings or commercial premises, they offer the perfect solution to a common problem. Of course, making sure that fire doors are closed when needed means nothing unless the fire door creates a good seal. If you can see daylight at any point around the perimeter of your fire doors, then something is certainly wrong. Fire doors or their frames should feature an intumescent seal to prevent flames or smoke from passing through any small gaps. These fire door seals often feature a brush-like element which is intended to prevent smoke from getting past. This seal should snugly fill the small gap between door and frame. A simple way to test the performance of the brush element of your fire door seals is to insert a postcard (or something similar) into the gap around the door. If the seal is in good condition, this should be held in place. If the seal does not grip the card then it may warrant replacement as the brush has likely worn over time. The condition of your fire door seals must be checked periodically. If they are found to be worn or missing, it is advisable to replace them immediately. Fire door seals come in two main types: self-adhesive surface mounted seals, or rebated seals which are sunk into the door or frame. Once again, it is a legal responsibility to ensure your fire doors and their seals are in good condition. If it were found that the maintenance of the fire doors had been neglected, then the responsible person could be prosecuted. We hope this article encourages you to ensure your fire doors and seals are in good condition. Making sure your fire doors are in good order, and preventing them from being wedged open is a simple task that can make a world of difference in the event of a fire. Spend just a few minutes today to ensure your fire doors are protecting your property as well as they can. For further information about fire doors and related products, visit our fire door help & information page, or contact us on 0800 612 6537. As more of us are living alone as we get older, we need to ensure that, as we retain our independence, we also remain safe. The 2011 census found that 9.2 million (16 per cent) of people, normally residing in England and Wales, were aged 65 and over, an increase of almost one million from the previous census in 2001. Of those, around 31 per cent were living alone. As we grow older we want to maintain our independence for as long as possible, but it has to be taken into account that some of us will not be as alert as were when we were younger. The early onset of dementia is not always detected and can manifest itself in carelessness around the home. In addition, older people are often released from hospital earlier than they would have in the past and not always with sufficient carers to look after their safety and well-being. Accidental fires are a major concern for those living alone and, on average, two people over 65 a week in Great Britain are dying in house fires. Concerned relatives will want to take precautions to ensure that every step is taken to safeguard their loved ones. The most obvious action is to ensure that adequate smoke alarms are installed in a property – a minimum of one on every floor. There is a range of mains and battery powered devices available; of particular interest are radio-interlinked smoke alarms, which are connected through radio frequency signals to ensure the fire alarm is raised throughout the residence. This is particularly important if high risk rooms, such as kitchens, are a distance away from bedrooms. Hearing disabilities mean that up to one in seven people may not be woken up by a conventional smoke alarm system. Smoke alarms for the deaf and hard of hearing use high-intensity strobe lights and vibration pads, which are placed under the pillow at night. Smoke alarms should be tested regularly, but for some of us this may be difficult if it involves being perched precariously on a chair! A friend or relative performing this task is the most sensible course of action. However, if an Ei radio-interlinked or hard-wired smoke alarm system is installed this can be tested remotely using a test switch that is either wireless or wired into the mains powered smoke alarm system in a convenient location. Turning on the “Test” switch will activate all interconnected smoke and heat alarms – equivalent to pressing the test button on an alarm. The kitchen is potentially the most calamitous area in the house with cooking appliances (mainly cookers and ovens) being the main source of ignition for more than half of all accidental dwelling fires, according to the most recent set of fire statistics for Great Britain. Whilst a helpful fire prevention tool for all of us, stove alarms are particularly useful for those of us who may become distracted whilst cooking. A relatively recent innovation, these devices react and sound a warning when a cooker becomes too hot. Specially designed for installation above a cooker, the Innohome Stove Alarm SA101 is simple to install. It attaches to the cooker hood using integrated magnets, however, it can also be fitted to the wall using screws. As they are battery operated there is no need for cables or an external power source. A loud 90dB alarm is activated if the cooker becomes too hot or when an empty hotplate is left on, warning of a hazardous situation before toxic gases are produced or a fire starts. The device includes a heat sensor that detects the temperature and the rate of increase in temperature. It intelligently learns from and adjusts its sensitivity to the users’ cooking pattern. The alarm does not react to fumes from cooking fat or steam. The SA101 is compatible with gas, electrical and dual-fuel cookers. A even more sophisticated device, but compatible only with electric cookers, is the Innohome Stove Guard SGK 500. This is also attached to the cooker hood or wall. The intelligent heat sensor assesses the temperature of the cooker top and its rate of rise and identifies when a hazardous situation occurs. On detection of a hazard, the heat sensor wirelessly communicates with a control unit, which in turn cuts off the electricity supply to the cooker. The control unit also enables connection to social alarm systems such as Telecare. Special attention needs to be paid to regularly servicing heating appliances and ensuring chimneys are swept. Carbon Monoxide (CO) is produced if there is not enough oxygen during the combustion process. It is commonly produced in appliances fuelled by LPG, natural gas, oil, petrol, wood or coal that have been badly fitted, are damaged, badly repaired or poorly maintained. CO is odourless, colourless and tasteless – the most dangerous common airborne poisoning in the world. Around 50 people a year die from CO poisoning in the UK, although some experts believe that this figure may be far higher because the symptoms are not easy to detect, with deaths often being attributed to old age. All homes should be protected by carbon monoxide alarms. Battery models can be bought for less that fifteen pounds and some models have longlife, sealed-in ten year batteries that provide long-term peace of mind. Mains powered models can be wired into the electric circuit or plugged into a wall socket. Natural gas and LPG (liquefied petroleum gas) are used for heating, cooking or heating water. As we are getting older, we are becoming more likely to forget to switch off a gas appliance or to light it in the first place. If, however, a gas cooker is left on without being lit, an explosion could eventually occur. Devices for detecting such escaping LPG or natural gas in domestic properties are available and warn us of such an occurrence. The AMS S/200P gas alarm is simply plugged into a socket and delivers a visual (LED) and audible warning upon detection of flammable gases. It also features relay outputs for interconnection to external devices. If you are caring for an elderly friend or relative it is advisable to do a quick safety check around the property. Are the escape routes uncluttered and easy to navigate? Are plug sockets overloaded? Some of us have a tendency to hold on to treasured electrical items such as old radios. These may well be far more sturdy and reliable than those on the market today, but how safe is the wiring? How safe is the furniture? Items that have been bought many years ago will probably not meet the latest fire ratings. Impregnation sprays are available to protect soft furnishing, bedding and curtains as well as decorations against catching fire (useful on Christmas trees and decorations as well as soft furnishings). They come in three versions: ‘standard’ for treatment of decorations, real Christmas trees, paper etc., ‘washable’ (can be machine washed) for treatment of bedding, curtains etc. and ‘special’ for treatment of artificial flowers, plastic decorations etc. Finally, is it a good idea to install a fire extinguisher, in case all the precautions fail? Fire services have traditionally preached that people should get out of the house straight away if a fire breaks out. However, a survey carried out by the FIA found that over a twelve month period over 1,600 injuries were prevented and 24 lives saved by the use of fire extinguishers. The general interpretation of the statistics was that an extinguisher (irrespective of size) will put out a small fire. Once it becomes too big it becomes difficult to tackle with any number of extinguishers and the building should be evacuated. If a fire extinguisher is to be installed, the latest water mist appliance is the most versatile for the home. It works by dispersing microscopic ‘dry’ water mist particles to suppress fires and extinguish burning materials very rapidly. It can be used on just about every type of domestic fire, including deep fat fires, and can be safely operated on live electrical appliances, as it only contains de-ionised water which is unable to carry electrical current. There are no chemicals involved, so if it is discharged in a cooking area there is no danger of contaminated food. If you have any specialist questions, please contact Safelincs on 0800 612 6537 and our friendly staff will be happy to help.